Having previously only been confirmed for a Middle East launch, BlackBerry has now revealed that the BlackBerry Motion will be coming to the UK before the end of the year. In fact, you should be able to pre-order it from Carphone Warehouse today for £399, though the listing doesn’t seem to be live at time of writing. Other stores, including Selfridges, John Lewis, Dixons Travel, Currys PC World, Amazon, Very and Littlewoods, will be stocking the BlackBerry Motion from November. So why should you care? For one thing the BlackBerry Motion has a big 4,000mAh battery, which supposedly offers at least 32 hours of 'mixed use'. It’s also the first BlackBerry handset to offer IP67 water and dust resistance, meaning it can be submerged up to 1 meter in water for up to 30 minutes. 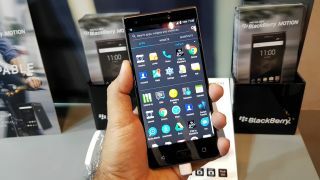 And it sports BlackBerry’s suite of security features and a new 'Locker', which can house documents and photos, protected by a PIN or fingerprint. Otherwise the BlackBerry Motion looks to be a fairly typical mid-range handset, with an aluminium frame, a textured back, a 5.5-inch 1080p screen, a Snapdragon 625 chipset, 4GB of RAM and a 12MP camera. It’s priced accordingly, but has a lot of competition, so it will be interesting to see whether people take to it.